Now, we all know that The Temptations were the trail-blazers for Norman Whitfield's unique brand of socially-conscious "psychedelic soul" and they produced six wonderful albums exemplifying the genre. However, it is also a pertinent thing that Norman Whitfield never produced the same song twice in the same way and he used five Temptations tracks on this album, but produced in a totally different way - either stretched out, slowed-down or speeded up. The other two tracks were made famous by Gladys Knight/The Isley Brothers and Marvin Gaye. The result is a magnificent slice of aware "message" music - full of buzzy guitars, sumptuous horns, funky breaks, intoxicating percussion and kick posterior make and female vocals. 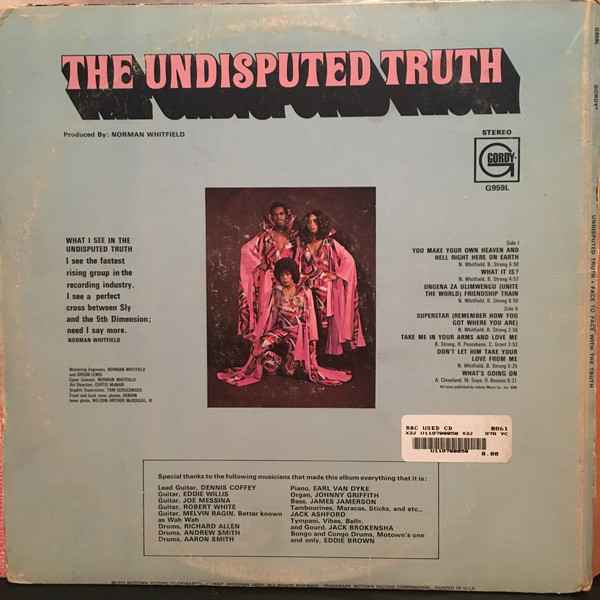 Although The Temptations were great, in some ways, the ideal vehicle for Whitfield's powerful music was The Undisputed Truth. The first of the seven tracks, "You Make Your Own Heaven And Hell Right Here On Earth" is slower than The Temptations' version and it really gets the message across. "What It Is?" is upbeat, lively and full to the brim with pulsating funky soul. 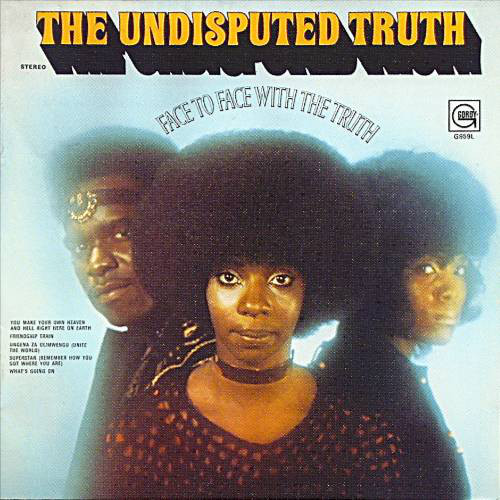 Joe Harris, Brenda Joyce and Billie Calvin lay down some fantastic vocals here and throughout this impressive album. The sound is also absolutely wonderful in its remastered format. Big, warm, full and bassy. The first huge production track is "Ungena Za Ulimwengu (Unite The World)" which is merged with Gladys Knight's "Friendship Train" to deliver one hell of a message for racial and cultural unity. "Superstar (Remember How You Got Where You Are)" is a short, sharp, pounding single-style cut, as indeed is the bassy, rhythmic take on "Take Me In Your Arms And Love Me". This album has it all. It really was a golden age for soul/funk. They don't make albums like this anymore. "Don't Let Him Take Your Love From Me" is magically soulful with one sublime vocal. Superb. Marvin Gaye's iconic "What's Goin' On" is given a nine-minute, extended soul workout full of killer vocals and infectious percussion. It is the match of the original. This is a most underrated, highly recommended album. Ain't that the truth. Can you dig it?